A fixed photoionization detector (PID), the RAEGuard 2 PID measures a wide range of volatile organic compounds (VOCs). The RAEGuard 2 PID provides an analog (4-20mA) three-wire signal output, RS-485 Modbus digital signal output and operates on 10 to 28 VDC. 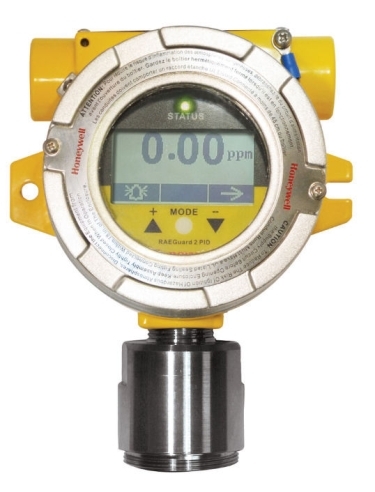 The maintenance and calibration of the RAEGuard 2 PID has been greatly simplified as the digital PID module can be simply removed in hazardous locations for maintenance or calibration. There is a graphic display and LED light status indicator for the RAEGuard 2 PID. The LED light status indicator for fault and alarm conditions. Additionally, Low, High and Fault relays can be configured to set off process controls or external alarms. There have been over 200 correction factors pre-programmed and allow users to display readings of a specific target gas. The RAEGuard 2 PID detector's magnetic key interface enables the detector to be calibrated and operational parameters adjusted with the explosion-proof enclosure in place. 050-0000-004	DigiPID lamp, 10.6 ev, 1/2"
081-0017-000	Kit, Lamp Cleaning (cleaning solution: Isopropanol) Note: The recommended cleaning fluid Isopropanol is not included.